Jellyfish sting in Malta - what to do? Jellyfish sting – what to do? It must have happened eventually, right? I got stung by a jellyfish. 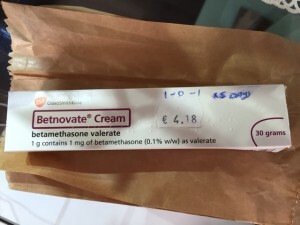 I believed it wouldn’t be something new for me, as I grew up on the shore of the Black Sea, but apparently jellyfish in Mediterranean sea is different and much more unpleasant (read: it hurts soooo *** much!). 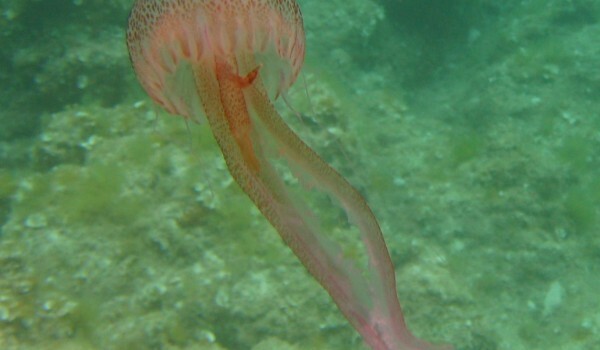 The jellyfish I met was a Mauve Stinger – one of the most widespread jellyfish near Malta shores. 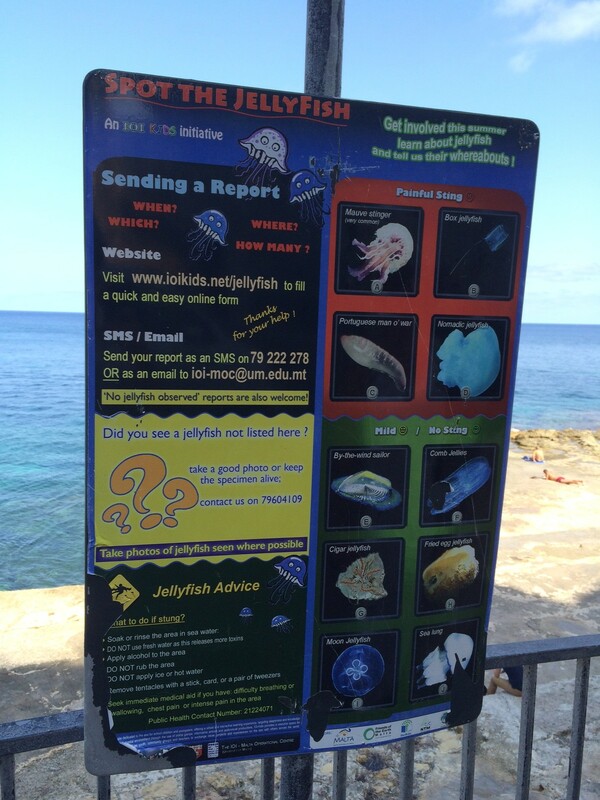 What to do if you were stung by the jellyfish in Malta? Jellyfish like Mauve Stinger has small “hooks” on its tentacles that stack in your skin and keep releasing poison even after you get rid of the jellyfish. 1. First thing you have to do – scratch the skin on the place of a sting with something sharp – if you don’t have knife, try to scratch it off with credit cards. Don’t scratch it with your fingers/nails – you’ll just make it worth. 2. Keep the part of you that got stung in the sea water. Don’t apply fresh or hot water! 3. If you have some alcohol with you – you can put it on. That would stop further releasing of the poison. You can also apply vinegar. Although, Mauve Stinger is the most common jellyfish, there are other species and they might be more poisonous. So it is a good idea to take a look on the jellyfish to see how does it look like. If there are Lifeguards nearby – you better ask them for assistance, they might have something special to apply on a sting. Important! If a large part of your skin has been affected, or eyes, or mouth, or you start feeling dizzy, or hot, or it’s hard to breath, or there are other abnormalities – go to the doctor immediately! Some people get severe allergic reaction. Also if a small child got stung or an old person – it is better to go to the doctor. The problem with mauve stinger sting – is that it could hurt for a long time – up to couple of weeks (depending on how well you managed to scratch a sting off), and it can start to inflame again. That was the case with me – we scratch off the sting very well from my hand (thanks to a fisherman who came to help and had a knife), but we didn’t scratch it off between my fingers – after 2 weeks I had an inflammation and went to see a doctor, that prescribed to apply Benovate Cream 0,1% twice a day for 5 days. Where to find a doctor? 1. In severe cases go to Mater Dei Emergency department (map) or call emergency 112 (see also). 2. General Practitioners (GP) are seeing patients in the cabinets in pharmacies. For example – Potter’s pharmacy in Paceville, St. Julians. What you can do to prevent jellyfish sting? Among some obvious things like “swim with goggles or mask”, “dress you kids in full swimming suite”, “apply anti-jellyfish gel” etc. – there is another very efficient thing – follow the wind! Pick up locations where wind is blowing from the shore into the sea not vice versa – http://www.windfinder.com/forecast/luqa. Hope this article was helpful! Some more information can be found here. More often than not, people panic when they have to deal with a jellyfish.